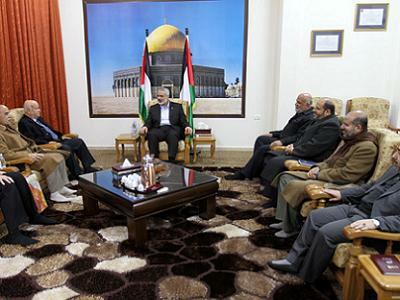 A Fatah and Hamas delegation is preparing to head to Cairo next Tuesday to hold meetings in favor of applying the reconciliation agreement signed in Cairo in May 2011, member of Fatah’s revolutionary council Fayiz Abu Aita said Wednesday. The Fatah delegation is scheduled to leave to Cairo on Tuesday, which will come one week after the consensus government started taking over its responsibilities in the Gaza Strip. He reiterated that all issues that have arisen since Hamas took control of Gaza a decade ago — such as the administration of the border crossings with Israel and Egypt, unpaid salaries to public employees, and the territory’s dire electricity crisis — would be discussed and resolved in Cairo. Abu Aita’s statement came a day after the National Consensus Government convened for the first time in three years in Gaza City, as officials arrived from Ramallah to begin Egyptian-mediated efforts to reactivate the unity government to rule both the West Bank and Gaza. Fatah, which leads the government, was driven out of the territory in 2007 after a lost election and civil war with rival Hamas. Despite multiple attempts over the years aimed at reconciling the groups, Palestinian leadership has repeatedly failed to follow through on promises of reconciliation and holding of long-overdue elections, as both movements have frequently blamed each other for numerous political failures.